Everyone starts by enrolling and getting their WCA Passport, a portable, personal, permanent record of their achievements as a professional — a “Passport” to career success. 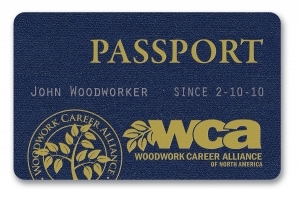 The Passport is a portable credential for individuals in the woodwork industry to quantify and qualify their ability to operate woodwork tools properly and safely to create high quality wood products. Certificates are not tied to specific occupations or jobs. Rather, the Skill Standards empower employers to select the tools and tool operation levels relevant to their jobs or training needs. Woodworkers receive Tool Points through a performance assessment that is fair, defensible, clear, teachable, observable and measurable. A woodworker’s skills and knowledge are assessed by a WCA Accredited Skill Evaluator who observes the candidate as s/he uses a tool and then inspect the final product, ensuring that the woodworker’s technique and product complies with WCA standards. Skill Evaluators record and submit their evaluations to WCA electronically and issue the appropriate Points in the Woodwork Passport. Every Passport Holder has access to the WCA REGISTRY of his/her personal records. Use the Enrollment button below to start your journey.